It is with great joy that we present the 16th edition of AUTOP – National Fair of Autoparts, Motorcycles, Accessories, Equipment and Services, that will take place from August 15 to 18, 2018, in the Center of Events of Ceará. 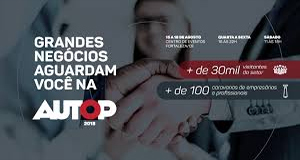 Promoted by the Sistema Contracopias / Assopeças (CE), AUTOP is the only fair in Brazil held by a class entity, becoming a reference for the automotive sector in the North and Northeast. We will get to 2018 renovated. A vision of the future that is reflected in our new logo, a cycle that closes from the union of all the parts, glimpsing new horizons for the sector and for Brazil. That is why AUTOP has consolidated itself as an important pillar for the production chain in the automotive sector, a scenario for doing business, networking and training. We invite all of you to join us so that together we can build the future!